The PSZ-HC1T and PSZ-HC2T portable hard drives offer storage capacity of 1TB and 2TB, respectively, and a dual USB 3.1 (1st generation) Type A and Type C interface for enhanced connectivity. The Type A interface comes with a connected cable for ease of use. The Type C interface, on the other hand, allows you to use a long USB cable, if necessary. The silicone housing makes these hard drives extremely robust and reliable, but also resistant to shocks, splashes and dust. The large storage capacity of both models and their high transfer rates of 138 MB / s * make them perfect tools for transferring data. Pre-formatted for the exFAT file system, they are compatible with a wide range of Sony devices, Macs and Windows computers. The dual USB 3.1 (1st generation) Type A and Type C interface offers improved connectivity and easier operation. The Type A port includes a convenient connected cable that you will not lose. The Type C port allows you to use a long USB cable, if necessary. This hard drive has a silicone housing that is shock, dust and splash resistant * 1. In addition, the discs come with a hard protective case for easy and secure handling and transport. 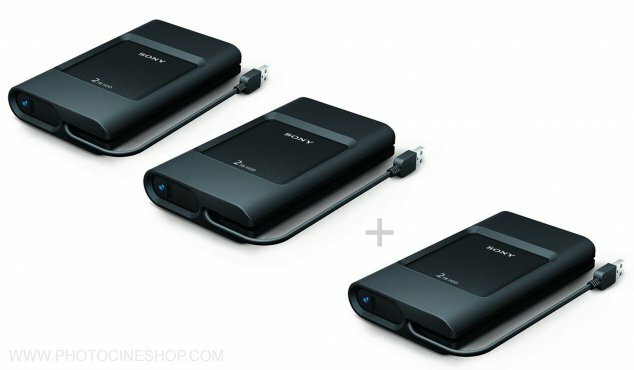 In addition to meeting military standards * 2, these hard drives have passed Sony's most stringent tests. They are able to withstand a fall of 2.4 meters * 3 (with the hard case, 2 meters * 3 without the hard case). These discs are also protected against splashing, for example in light rain. * 1 Complies with IP5X Dust Resistance Standard and IPX4 Splash Resistance Standard, with silicone housing and hard case. * 2 Tested in accordance with MIL-STD-810G. * 3 According to tests made by Sony; Fall on industrial carpet, on the 6 sides of the hard disk / SSD. Sony can not guarantee the protection of the recordings or the protective case in all situations and all conditions. Do not drop it deliberately and do not subject it to impact. Bus power reduces the risk of data failure in the event of sudden or unexpected power loss. The dual interface (Thunderbolt and USB 3.0) ensures data security in the event of a sudden or unexpected problem with a port. The Memory Media Utility software, available for download, makes it easier to manage media. The display of media information includes the model name and available free space. The disk status check provides an additional level of security. The software also allows content to be saved to three destinations simultaneously with a verification function. The library allows you to view information about all the portable storage devices registered in the software. The hard drives are pre-formatted for the exFAT system to be compatible with a wide range of Sony devices, Macs and Windows computers. The PSZ-HC1T model offers a capacity of 1TB and the PSZ-HC2T model has a capacity of 2TB. Disks with high storage capacity and high data transfer rates of 138MB / s.